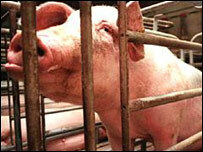 An organisation in Israel has gained rabbinical approval to train pigs to guard Jewish settlements in the West Bank. Until now, Jewish settlements have been guarded by men with guns and also by guard dogs. But a new idea - guard pigs - has been thought up by an organisation called The Hebrew Battalion. The man in charge, Kuti Ben-Yaakov, insists it is a serious proposal. "Pigs' sense of smell is far more developed than that of dogs," he said. "The pigs will also be able to identify weapons from huge distances, and walk in the direction of the terrorist, thereby pointing him out. Under some interpretations of Jewish law, the pig is seen as an unclean animal, so Mr Ben-Yaakov has had to seek special approval from rabbis in order to begin training his hoped-for legion of guard pigs. "It's clear that in a case like this, the ban that was imposed on raising pigs in the Land of Israel doesn't apply," said Daniel Shilo of the Yesha Rabbinical Council. BBC Middle East correspondent James Reynolds says that some settlers have dismissed the idea. "Spare us from this nonsense," one settler spokesman told the BBC. "It will never happen."